Alumni Michael ’74 and Virginia Munger Kahn ’76 have established an endowed fund for career advancement with gifts totaling $1.158 million. The fund will support participation by Grinnell students in “high-impact” experiences, including supplementing unpaid and low-paid domestic and international internships in any sector of the economy, job-shadowing, interviewing and networking, and attending career-oriented, professional development conferences. “Michael and Virginia understand that the priorities and resources of the College’s career initiatives will evolve over time, and they have created a funding mechanism to accommodate programs and ideas beyond their present scope,” says Mark Peltz, Daniel and Patricia Jipp Finkelman Dean of Careers, Life, and Service. Michael and Virginia Kahn met while students at Grinnell and have maintained a lifelong affinity for the College, serving it in many ways. In 2015, Michael was elected to the Grinnell College Board of Trustees. As he has done throughout his career at TIAA in New York City, Kahn annually hosts as many as three student interns in various positions and locations throughout TIAA. Several of those internships led to full-time employment with TIAA following students’ graduation from Grinnell. Lizeth Gutierrez ’12: First Mellon Mays Fellow to Earn Ph.D.
Lizeth Gutierrez ’12 is the first Grinnell College Mellon Mays Undergraduate Fellowship (MMUF) fellow to complete her Ph.D., graduating with a doctorate in American Studies from Washington State University in 2017. Grinnell developed its MMUF program in 2009, and Gutierrez was accepted into its second cohort in 2010. Shanna Benjamin, associate professor of English and Grinnell’s MMUF faculty coordinator, invited Gutierrez back to Grinnell in September as the program’s kickoff dinner keynote speaker. “Having Lizeth there as an example of persistence and belief in oneself … I can’t imagine having anyone else,” says Benjamin. The Andrew W. Mellon Foundation’s goal in funding MMUF programs across the country is to diversify the professoriate by providing fellows with a set of tools — including strong mentors, financial support, and research and time management skills — that can be harder to access for students who feel like outsiders in the academic sphere. Funding supports an average of five new MMUF fellows at Grinnell each year. Fellows design a two-year research project with a faculty mentor and receive student loan debt forgiveness up to $10,000 if they enroll in graduate school. MMUF also sponsors travel to regional networking events, connecting students with a vast network of peers and mentors to help them through the graduate school application process and beyond. The importance of networks based on shared experience is central both to Gutierrez’s success in academia and to her own research. Currently a postdoctoral fellow at Macalester College, Gutierrez, who majored in Spanish with a sociology concentration at Grinnell, is studying how chisme (roughly translated as “gossip”) among Latina women working in the domestic industry functions as a tool of survival, helping them navigate their economic conditions and negotiate their rights. Read more about Lizeth Gutierrez ’12: First Mellon Mays Fellow to Earn Ph.D. 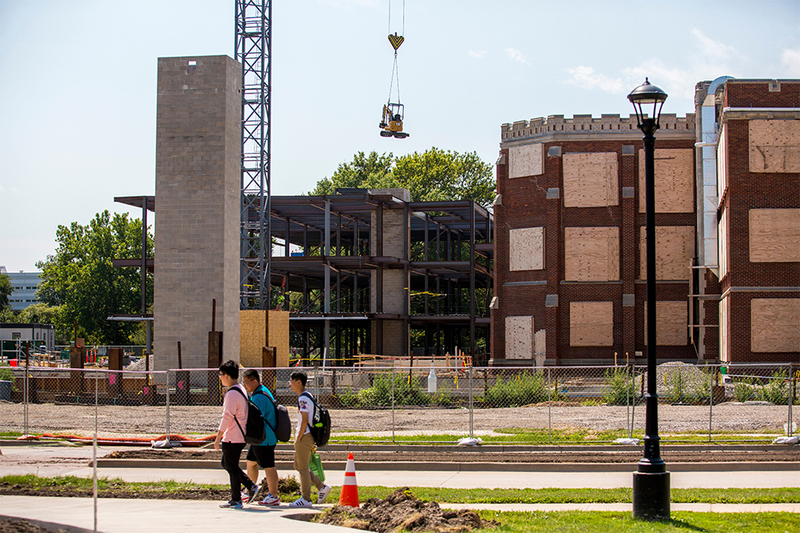 The South Pavilion of the new Humanities and Social Studies Complex (HSSC) took shape on central campus during the summer. Another view of the construction, looking south across Eighth Avenue, at the HSSC construction northwest of Alumni Recitation Hall (ARH). Three language houses on Park Street across from ARH were moved one block north during the summer. They will be ready for students to occupy this fall. 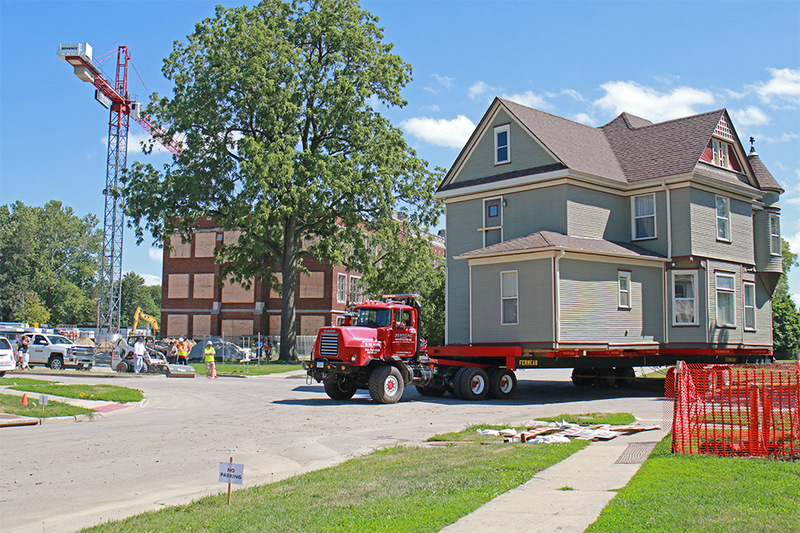 The houses were moved to make way for the construction of a new Admission and Financial Aid building on the southwest corner of Eighth Avenue and Park Street. See Grinnell’s Sexual Respect website for information about Title IX policies, procedures, and resources available to the campus community. Shuchi Kapila, professor of English, has been named assistant vice president for global education and senior global officer. She succeeds David Cook-Martín as head of the Institute for Global Engagement. The institute, which was established in 2016, focuses on internationalizing Grinnell on multiple levels. Kapila describes the institute as a central node that facilitates conversations between the Office of Off-Campus Study, the Language Learning Center, departments and divisions, and external partners. Kapila hopes to continue the excellent work that the institute has been doing with the Global Learning Program and course-embedded travel. She also plans to foster partnerships between faculty with expertise in different global regions in the service of comparative study. Cook-Martín left Grinnell in 2017 for a position with New York University Abu Dhabi in the United Arab Emirates. This exhibition, featuring 47 paintings by 24 artists, showcases works from the Gond and Warli communities of central India, the Mithila region of Bihar, and the narrative scroll painters of West Bengal. Divided into four broad categories — Myth and Cosmology, Nature – Real and Imagined, Village Life, and Contemporary Explorations — the exhibition explores the breadth and variety of cultural traditions in India, revealing a dynamic aesthetic that remains deeply rooted in traditional culture, yet vitally responsive to issues of global concern. Many Visions, Many Versions: Art from Indigenous Communities in India was organized by BINDU Modern Gallery and toured by International Arts and Artists, Washington, D.C.
Ram Singh Urveti, Woodpecker and the Ironsmith, 2011. Acrylic on canvas. Photo courtesy of Sneha Ganguly. Shanna G. Benjamin, associate dean and associate professor of English, is one of 45 mid-level administrators in higher education nationwide selected by the Council of Independent Colleges (CIC) to participate in the 2017–18 Senior Leadership Academy. The academy is designed to prepare prospective leaders to assume positions as the chief officers in any division in independent higher education. “Professor Benjamin’s breadth of experience, including work in inclusive teaching and learning, mentoring, and development, make her especially well-suited for this opportunity,” says Michael E. Latham, vice president for academic affairs and dean of the College. Benjamin looks forward to merging her theoretical work in the academy with her practical work in the dean’s office. “I am honored to be part of such an energetic and diverse group of up-and-coming leaders,” she says. Benjamin will undertake a mentoring program, work with experts, participate in webinars and engage in a series of readings and case studies during the academic year, as well as participate in opening and closing seminars. Benjamin is a literary critic and biographer who studies the literature and lives of black women. Her term as associate dean at Grinnell began in January 2017. Shonda Kuiper, professor of mathematics and statistics whose work in statistics education is nationally recognized, recently received a $300,000 grant from the National Science Foundation’s (NSF) Improving Undergraduate STEM Education (IUSE) program. The grant project, titled “Student Engagement in Statistics Using Technology: Making Data Based Decisions,” will enable Kuiper and her team to develop inquiry-based, online games that simulate data-based decision-making embedded in a research-like experience. Kuiper says these inquiry-based games will help students understand and apply concepts from statistics and data science as they work with complex, “messy” datasets. She is collaborating with Rod Sturdivant of Azusa Pacific University and Ursula Wolz, Noyce Visiting Professor in Computer Science in spring 2017, now with Bennington College. David Lopatto, director of the Center for Teaching, Learning, and Assessment, will help develop an assessment tool for the games. This is Grinnell’s first grant from the IUSE program, which is relatively new, although many Grinnell faculty members, including Kuiper and Lopatto, previously have received funding from the NSF for pedagogical projects. This project fits well with the College’s efforts, supported by a grant from the Roy J. Carver Trust, to develop a curriculum in data science.